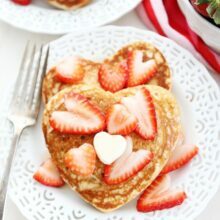 Heart Pancakes-these easy, whole wheat heart shaped pancakes are the perfect pancakes for Valentine’s Day or any day! Valentine’s Day is on Sunday and that means we will be able to sleep in and enjoy a nice, romantic breakfast in bed! Ha, let’s be realistic, we have a 4-year old and an 18-month old who love to wake up early, so breakfast in bed probably won’t happen, but we can make a special Valentine’s breakfast as a family! We are going to celebrate with Heart Pancakes. 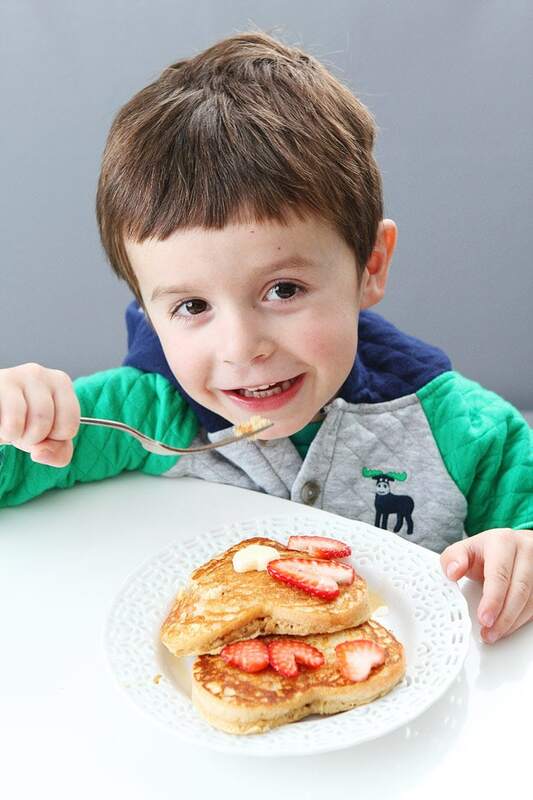 The pancakes are simple to make and our boys love them! We are going to have one big pancake party! 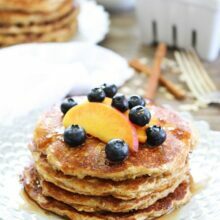 These whole wheat heart pancakes are light, fluffy, and easy to whip up! The boys love helping us make them, mainly because they are made with Annie’s Organic Whole Milk Yogurt, their new favorite yogurt! Caleb is a great helper, he usually helps us measure and stir, but Maxwell is not very patient. He just wants to eat the yogurt:) He eats while we cook! 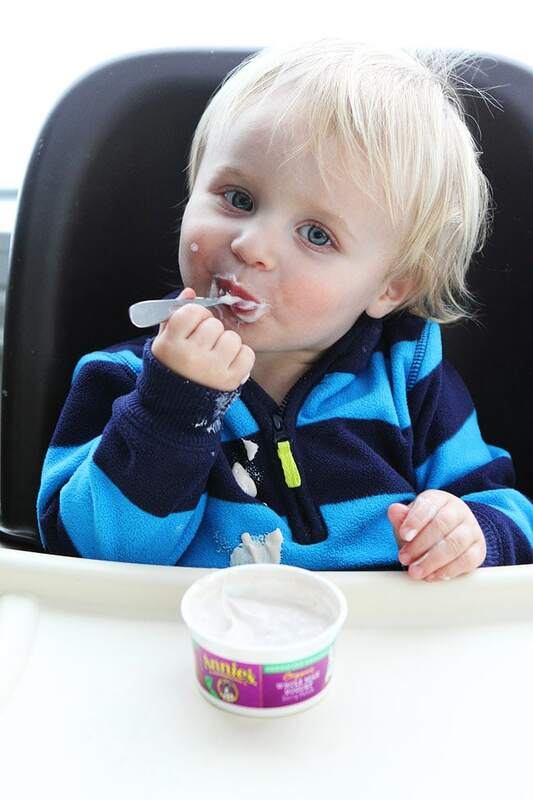 The yogurt comes in three flavors: Summer Strawberry, Berry Patch, and Very Vanilla. 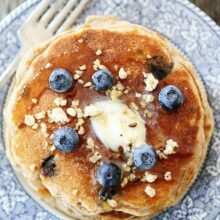 We use Very Vanilla, a creamy and slightly tart yogurt with the goodness of real vanilla to make our pancakes. For Valentine’s Day, we like to top the pancakes with heart shaped strawberries, a little heart shaped butter, and pure maple syrup. A breakfast filled with loooooove! 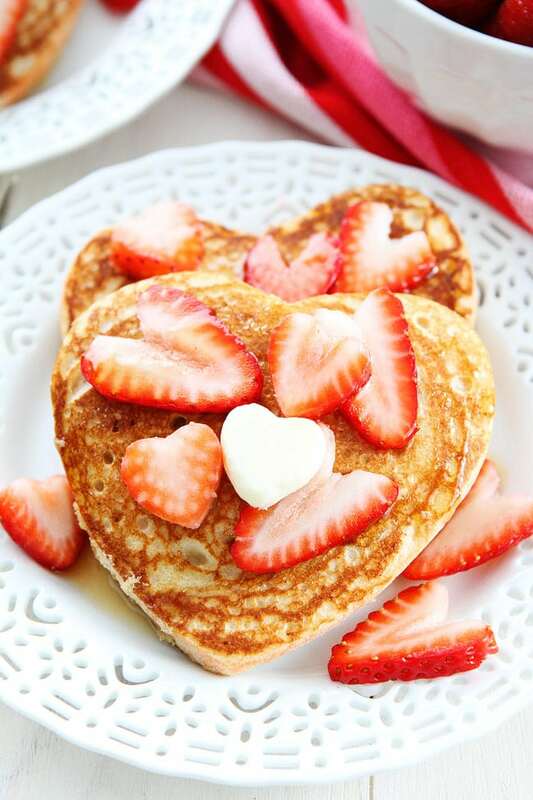 I am looking forward to Valentine’s Day so I can enjoy these cute Heart Pancakes with my favorite boys. The best way to celebrate the day of love! 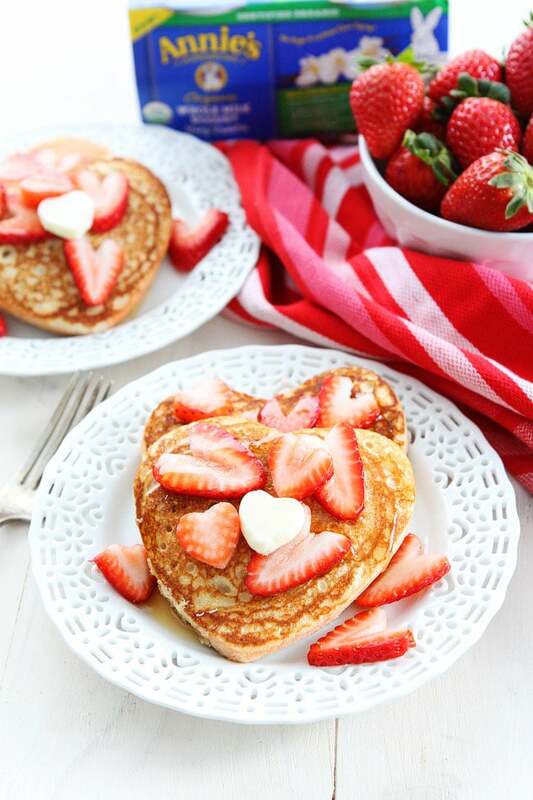 These simple, whole wheat heart pancakes make the perfect Valentine's Day breakfast! In a large bowl, whisk together the flour, baking powder, salt, and brown sugar. In a medium bowl, combine milk, yogurt, eggs, maple syrup, melted butter, and vanilla extract. Whisk until combined. Heat a griddle or pan to medium low heat. Coat with cooking spray. Spray the inside of a heart shaped cookie cutter with cooking spray. Place the cookie cutter on the griddle or pan and fill with about 1/4 cup of pancake batter. Cook until surface of pancakes have some bubbles and a few have burst, 1 to 2 minutes. Remove cookie cutter and flip carefully with a spatula. Cook until browned on the underside, 1 to 2 minutes more. 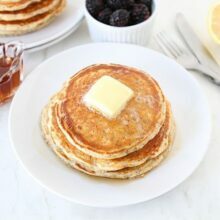 Continue making pancakes until the batter is gone. Serve pancakes warm with strawberries, butter, and maple syrup, if desired. Note-If you don't have a heart shaped cookie cutter, you can pour or pipe the pancake batter into heart shapes. It's ok if they aren't perfect. These pancakes freeze well. Let them cool completely and then wrap in plastic wrap and put in a freezer bag. When ready to eat, remove from freezer and reheat in microwave or the toaster. Love the kiddos faces! They look happy about that delicious food they get to devour! This is such a sweet idea, I love it! 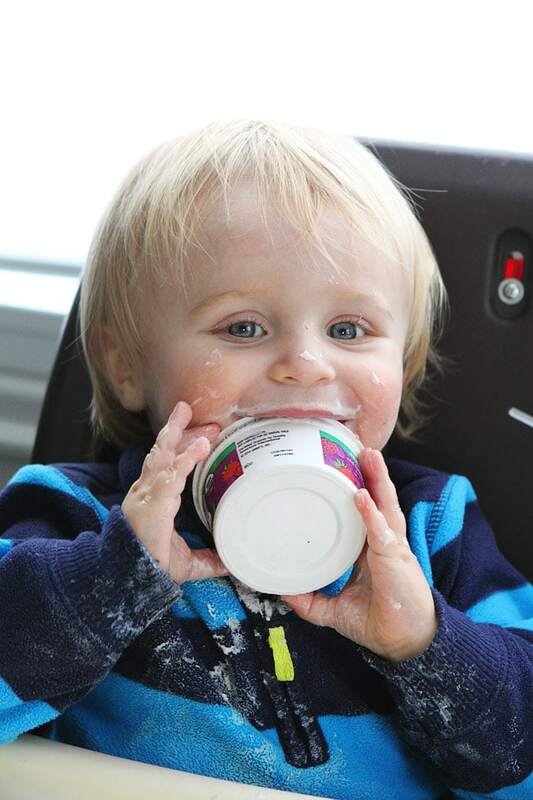 The yogurt is new and our boys love it!! These little pancakes are just too cute!!! The boys are so cute!! We have a 6 and 8 year old and we still won’t be doing any sleeping in or romantic!But the kids have so much fun with the little “holidays” like this- I love the heart pancake idea! Seriously, you have the cutest kids!! Also, these pancakes, LOVE!! 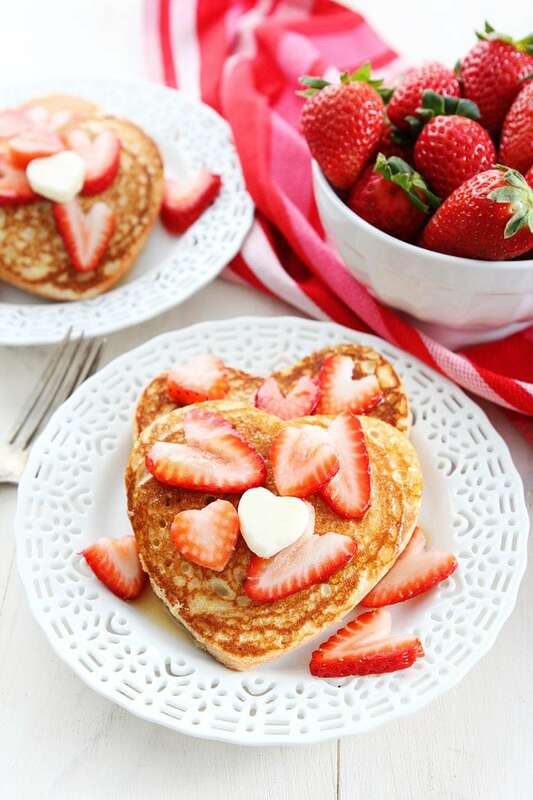 Those pancakes are perfect for valentines day! How super cute are these?! Your boys are ADORABLE!! Omg, I want to squeeze them! These are so fun! Perfect for Valentines breakfast. Hey girl- these would be so yummy! 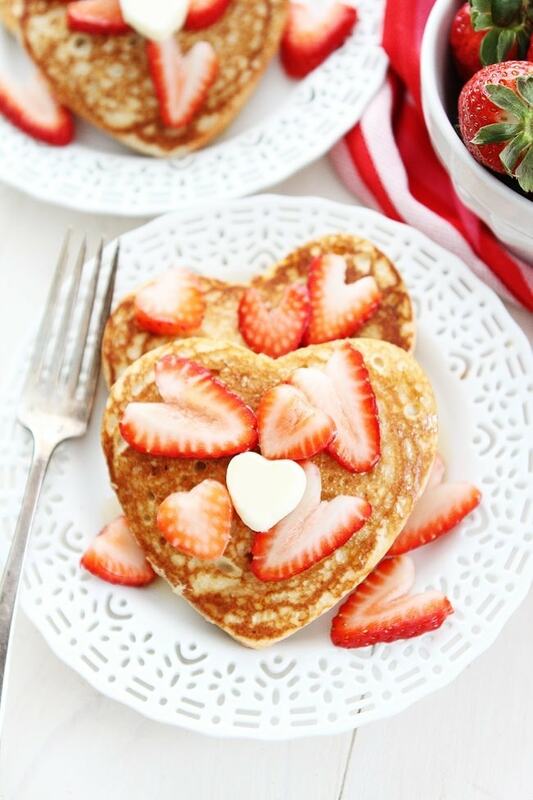 Heart-shaped pancakes are a cute idea! I want to try Annie’s new yogurt—especially, the “Berry Patch” flavor. Lovely. I will adapt the heart shaping by my favourite fluffy pancake recipe 🙂 thanks for the idea. So sweet for Valentine’s Day!! So sweet for the little ones on Valentines!! Could I prep the batter the night before? 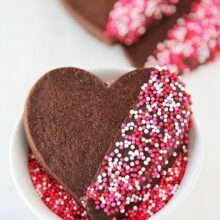 My daughter has dance class at 9:30, and I’d love to make these for Valentine’s breakfast ahead of time. It should be fine to make the batter the night before! Or you could reheat the pancakes! Enjoy! These were a huge hit at our house, thank you! Please add calorie count to this and all your recipes. I love your blog and use almost all the recipes. Thank you. I am glad you are enjoying our recipes! We don’t have any plans to add the calorie counts at this time, but maybe someday! Will have to try these too! what would an alternative be for the maple syrup?